Yeovil are looking to offload either Chris Weale or Artur Krysiak on loan, manager Gary Johnson has confirmed. 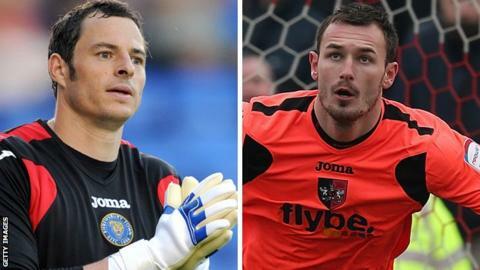 Both goalkeepers signed over the summer on two-year deals but neither have been able to hold down a first-team place. Johnson has now drafted in Blackburn keeper Jake Kean on loan and the 23-year-old was given the number one shirt in Tuesday's 1-1 draw with Crewe. "You're not going to have three goalkeepers not playing," Johnson told BBC Somerset. "One will need to go out and get some football." Weale, 32, began a second spell at Huish Park following his release by Shrewsbury and had played in every League One game this season prior to Tuesday. Former Exeter keeper Krysiak, 25, has made only one appearance in the League Cup defeat by Gillingham. "I haven't lost faith in the two lads, but unfortunately during pre-season and the start of the season, we've been doddery at the back," admitted Johnson, whose team are 16th in the table. "Chris had a good little spell, but then made a mistake against Coventry. You don't want to keep putting them in even though they want to be in. "When we got the opportunity with Jake, I needed to do that. Time will tell whether that was the right decision or not. "They've both taken it well and they both understand. They've all been helping each other this week and that's what it should be."